The title pretty much says it all: Easter was not about the chocolate (though Oma & Opa spoiled Sprout with what I think amounts to half his body weight in Lindt chocolate) but more about being violently ill. I succumbed first, shortly before we made it to Winfield. Saturday I spent in bed dozing & reading all day. Later that night, we were rudely awoken by Sprout's bout with the bug. Thankfully he didn't throw up too many times, but we did end up using most of the towels in the house. 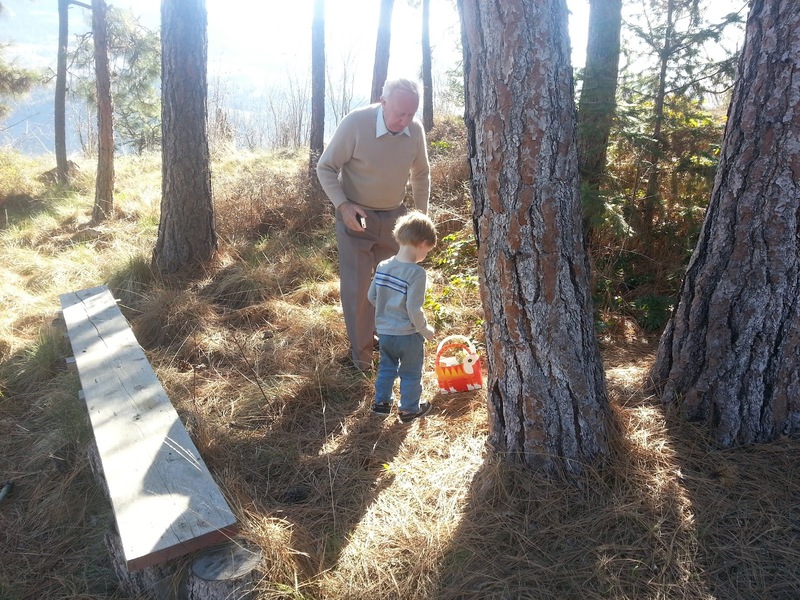 Opa guides Sprout on his first Easter egg hunt. Sprout was almost back to normal Sunday morning, just in time for his first Easter egg hunt, or rather, Easter basket hunt. Then, right on cue that afternoon, it was Oliver's turn to experience the joys of Norovirus. I somehow managed to squeeze in two homework assignments in with all the gastro-bug fun & get them emailed off while 'borrowing' a neighbour's unsecured wifi signal (Oma & Opa don't even have a computer, let alone Internet access). Though I finished classes Thursday, I still had a couple of assignments due over the weekend. The weather was apparently even warmer in the Okanagan than on the coast--the forecast was for highs of 21 Celsius--but we never got out for that hike we'd hoped to do. I barely got out of the house, in fact. By Monday, we'd all recovered enough for the 400km drive home & that was that. While it definitely sucked to lose my entire long weekend to illness, I'm happy that I didn't get sick earlier & miss classes. Any later & I would have missed part of my practicum, which started today. With only three weeks to absorb as much practical experience as possible, I don't want to get sick. Now if we can all stay healthy for another few months, that would be lovely! Here's hoping your long weekend was a bit more fun than ours was. What did you get up to? Sorry to hear about the Norovirus. I hear it is pretty messy. I've never had the pleasure, but it smashed through my sister's family about two years ago. It sounds miserable. Tycho has never had much chocolate before, so it took a while for him to figure out that his Easter candy was actually for eating. Luckily, we didn't overdo the Easter treats for him. However, Tycho has been fighting some sort of infection since yesterday (not Norovirus) that has given him a fever and prevented us from having our anniversary dinner--and sleep--last night. LOL--should have known better than to mention brand names. Is there a Purdy's in Kelowna? I can't say I've ever been chocolate shopping there. Sorry to hear the little guy's sick. & on your anniversary too? Double bummer. Tycho has also now developed a mild case of conjunctivitis, which probably means that we will all have it within a couple days. It is certainly bacterial, so it is messy. It should pass quickly though. The nights are terrible. I've had to spend the last couple nights on the couch with him. He feels like a little furnace at times, but his temperature hasn't gone over 102. It's like that Fifth disease onset, with pus-covered eyes. My experience with Norovirus was almost 10 years ago with the onset occurring at about 7pm Christmas Eve, and resulted in the only Christmas dinner I didn't eat! The weather was definitely pretty fantastic here - I actually had some people ask if I had gone away over spring break because I got so much colour/freckles over the weekend!